To get the best out of our printers, labelers and print & apply systems, we strongly recommend to use our range of labels and print ribbons. High quality at competitive prices, our consumables complete our solution to your benefits! We offer you far more than a simple label – we support our customers with individual tailored labeling solutions across a wide variety of industries and environments. Whether you’re responsible for a distribution centre, a retail outlet or warehouse. Whether your industry is food, logistics, personal care, chemical or pharmaceutical. Whether you’re a supplier, manufacturer or service provider. Our experience is your advantage. To achieve all of this effectively, labels have to meet certain requirements: they have to be correct and legible, easily applied and able to integrate with your labeling hardware. NOVEXX Solutions always has a suitable label. We offer you a wide range of labels, no matter the shape, color, size, material or application – whether it’s a pallet or box label or for single-item marking. 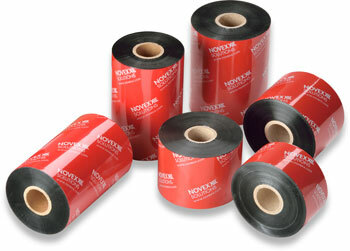 NOVEXX Solutions has specialized in label technology for more than 50 years. We’ll provide you with the perfect label adapted to any type of printer or labeling system. Whether your labels are made of paper or plastic we can supply you with print ribbons in different qualities (wax, wax-resin, resin) and colors, that fit perfectly for your purpose. Speak to our experts and benefit from our experience in finding the best possible match for your application. To achieve the best results for our customers, we combine our expertise in materials, hardware and industry knowledge. Do you want to get more information about our consumables? Call us on +49 8165 925-299. We look forward to provide you with a perfect fit for your application.